March « 2012 « Dr Deborah Swallow – Global Cultural Diversity..
do – give a “Marteniza” with a wish for good health to each of your family, friends and colleagues. The first of March has been a special holiday for Bulgarians since old times. On this day they begin exchanging white and red tassels. They’re called Martenitzy, after the month of March (Mart in Bulgarian). 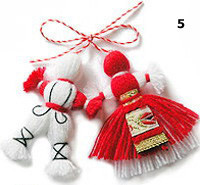 During this month, Bulgarians wish friends and relatives “good health” through the symbolic red and white colours. According to folklore, a healthy and beautiful Bulgarian woman is always described with white skin and red cheeks. This is a wonderful gesture of love and good will! It’ll bring you good luck as well! Commonwealth Day is an opportunity to promote understanding on global issues, international co-operation and the work of the Commonwealth’s organisations that aim to improve the lives of its citizens. This year, the Queen is calling for people who live in the Commonwealth to celebrate the “extraordinary cultural tapestry” of the “unique gathering of nations” of the 54 member nations. Holi is a Hindu spring festival that traditionally celebrates fertility and harvest. Don't feel offended, it's Holi! Recently, it has also gained religious elements, marking some of the ancient Hindu legends, such as the legend of Prahalad and Holika.